Products That Didn't Work for Me! | Vanity and Everything in Between. Warning: this post is not entirely a positive one. Remember, what works for you might not work for me and vice versa. Last 2013, I was on a "minimise pore" streak that I used a lot of pore-minimising products because he derma told me that my pores are getting bigger and I didn't want to have a surgery for that. 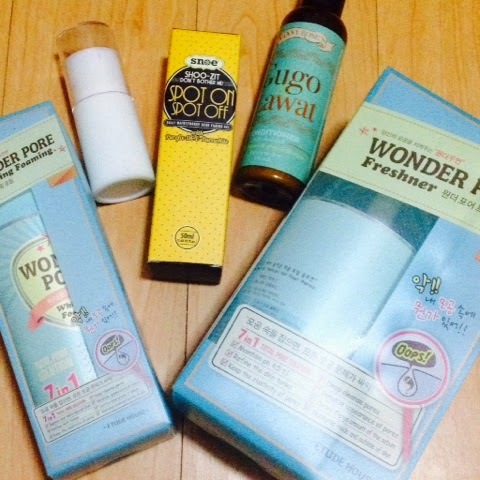 When I saw Etude House's Wonder Pore Skin Care line, I told myself I'd give it a go. If it works, then good for me. After two months of using it, I wasn't contented with what it did to my face (of the lack thereof). First of all, it doesn't have a any anti-acne property and it seemed that I broke out more often when I was using this. Second, no wonder pore happened during and after I used this. I don't recall anything significant happening to my pores when I used this. So, I stopped (and also because I was breaking out and the other products I used didn't seem to work well with Wonder Pore). Second on this list is the Snoe Beauty Happy Heels Blister Balm. I got this for a whopping PhP550 pesos in the hopes that it can heal my tiny blisters on my feet cos of my 4-5 inch heels! But no, nothing happened. Quite honestly, it's just the jumbo version of their beso balm. Not effective at all. Should've just saved my money. Another product from Snoe Beauty that disappointed me was the Spot On Spot Off acne fading gel. Guess what, it never faded any of my pimples. It didn't aggravate but it didn't make it smaller either. That's why it's included in this list. Lastly, Nanny Rose's Gugo Lawat anti-hait fall conditioner. I got its shampoo counterpart from one of those beauty boxes (can't exactly remember). I held off using the shampoo for quite some time because I was looking for its conditioner and it was always out of stock at SM and Watson's. Then last month, I finally saw it was back on stock so I bought one in a heart beat! Used this combo the following day and oh my gosh, it left my hair tangled and very difficult to comb. It was pretty consistent, too, as I used it everyday after that. So, I don't understand how the conditioner conditions and softens my hair. This is probably the first time I've encountered a conditioner that makes my hair even more unruly and tangled after shower. What I did to make this "work" or to finish these products because I didn't want my money to go to waste is I mix my VS hair treatment while washing my hair so I can achieve a softer hair. Here are some products that didn't work for me. If you've tried this and didn't work for you as well, let me know! I'd like to know your experience about it! If the product worked for me, let me know as well! I feel like some pore-refining products tend to clog the pores and make the condition worse. I've stopped using silicone primers for the meantime, just to let skin breathe. Especially now that I have dry patches. If my pores clog up and I need to exfoliate more, it'll just serve to aggravate my dry spots. I used EH Wonder Pore and Nanny Rose too. Both of them disapoints me as well. Same as your experience about them, EH wonder pore did broke me out too though I saw that it made my pores smaller a little bit. And about Nanny Rose, oh my! It's the worst brand I'd ever tried, glad I got it for free that time. We have the same experience with Nanny Rose too. I actually didn't finish it up to the last drop. I think products with Silicone is one of the reasons of clogged pores. So I skipped products that have this kind of ingredient. It is. Thats because they use organic materials/ingredients. I'm a tad confused though cos their lipstick has lead. Was able to visit a blog before and she did the lipstick test (if it has lead content) and Snoe was one of the lipsticks she tested. Yup it turned dark. Thats why i never bothered buying another lipstick from the brand.